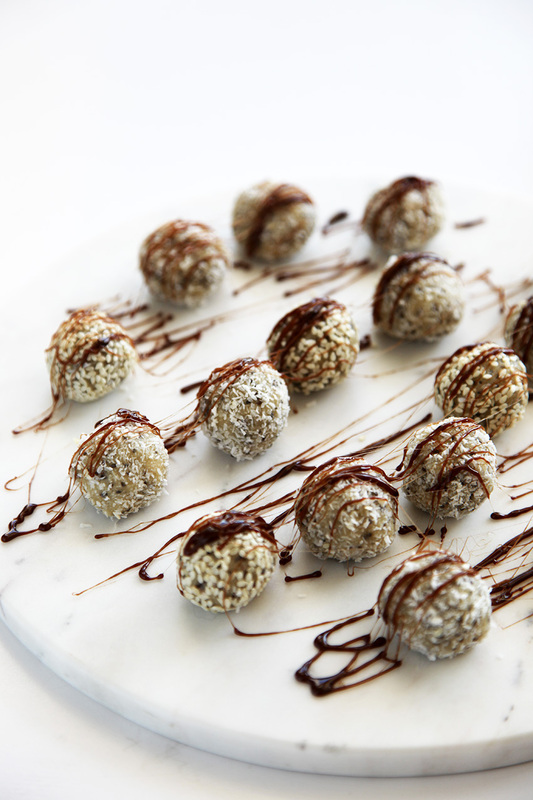 These macadamia bonbons are super healthy, they contain macadamia nuts, chia seeds, tahini, coconut, vanilla and I have sweetened mine with maple. If you want a sugar-free alternative use rice malt syrup. I was pretty excited when my toffee idea came together. I put brown rice syrup in a small saucepan and heated it over medium heat until it bubbled up and started to turn a golden colour. I then mixed in a little unsweetened cocoa powder for a yummy sugar-free chocolate toffee – winning! Add the macadamia to a food processor and pulse til you active a fine crumb. Add the remaining bonbon ingredients and process until combined. Taste the mixute for sweetness and adjust to suit your taste. Add a little more coconut if the mixture is too wet or a tablespoon of water if too dry. 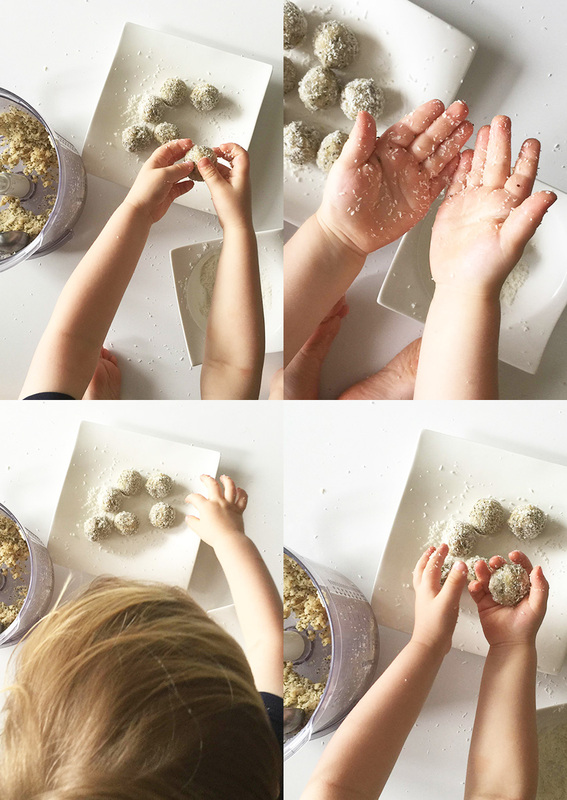 Using a tablespoon, scoop out some mixture and roll into balls, then roll in the extra coconut or sesame seeds. Add to a container and freeze the balls for a few hours. Add the syrup to a saucepan and heat over medium heat until the mixture starts to change colour. It will bubble up and change colour very quickly (It burns easily so keep a close eye on it). Once you achieve a nice golden colour, turn off the heat and mix in the cocoa powder. The mixture will become very viscose. 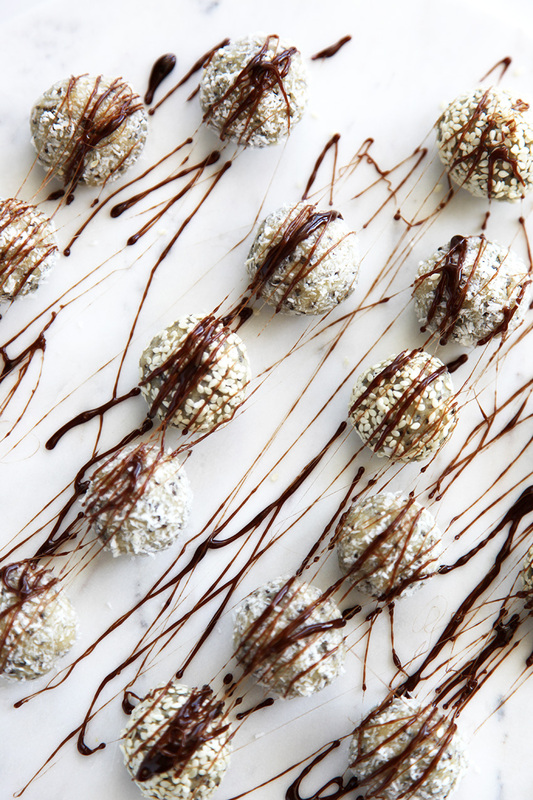 Dip your spoon in and run the strands over the frozen bonbons. It will set on impact. If the mixture gets too hard, warm on very low heat until it melts a little again. Serve or put back in the freezer for later. To add extra sweetness you could add a handful of sultana/raisins/currants etc..
Great recipe, will try this for the holidays. Great recipe, I love the drizzle! Do you think I could substitute macadamia nuts with hazelnuts? perfect! I am looking for edible gift ideas and these are the ones i needed for a nut lover friend! These look so tempting it’s hard to believe that they are healthy! These look tremendous. 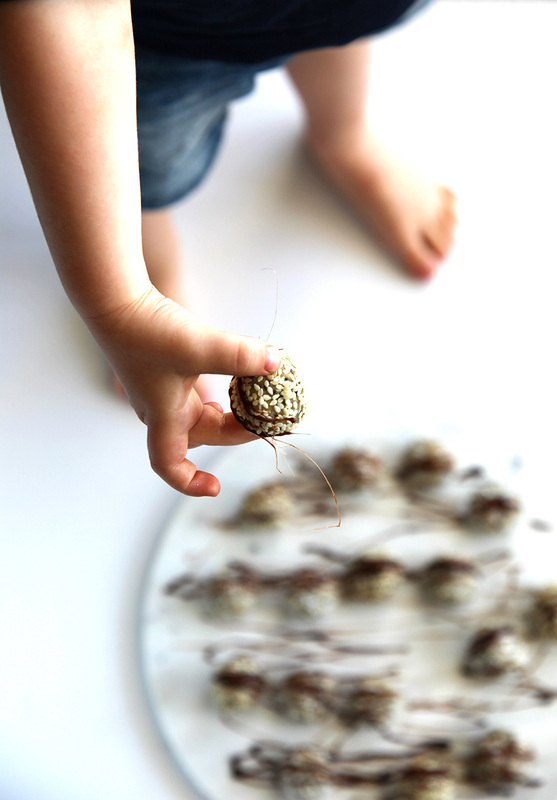 Nice photographs to complement what looks like a really great treat. These look delicious – perfect for the holidays! I love the photos!! What a beautiful and healthy treat for the holidays! Love your photos.